Surrounded on all sides by hill ranges and nearly cut-off from other north-eastern states, Manipur is known to rest of India as a place enriched by aesthetic art and culture. Love of art and beauty is inherent in the people and it is difficult to find aManipuri girl who cannot sing or dance. 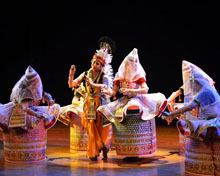 Much has been commented on the Manipuri dance, on its lyrical beauty and rhythm. Manipur presents a mosaic of traditions and cultural patterns. Particularly, it is world famous for the Manipuri style of classical dance, verymuch distinct from other Indian dance forms.The Manipuri school of dancing whether folk, classical or modern, is devotional in nature. 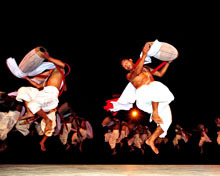 The folk dances of tribal people captivate the beholders with their exotic costumes and simple but graceful rhythm. Their folklore is quite rich in quality. The dances of the tribal people are ritualistic and recreational, religious and temporal. The ritual dances are performed at a particular rite, ceremony or sacrifice and these dances naturally have a spiritual and religious basis. The dances of the tribal people have a high artistic and aesthetic value. The rich culture and tradition of the Manipuris are also depicted in their handloom clothes and handicrafts. The Manipuri handloom and handicraft are world famous for its craftsmanship as well as ingenuity, colourful, colourfulness and usefulness. The creativeness in the habit and tradition of Manipuris has found expression in the designing of handloom and handicrafts products. The handloom products are as varied and colourful as the individual needs and tastes. Bed sheets, covers, tribal shawls, curtains, screens, saris and gowns of Manipur find markets throughout India and abroad. Their handloom and handicraft products sold by ladies in Khwairamband bazar, the largest women's market in the country, are favourite pieces of souvenirs for the visiting tourists. The colourful tribesmen are the dwellers of the blue mountains which surround the green and fertile valley in the centre. Each of these tribes has their own distinct culture and tradition which find expression in their dance, music, dress, customary practices and pastimes. A tribesman represents a tradition, a way of life, a cultural heritage and love for life and beauty. The culture of tribesmen, their love and need for leisure and creation find eloquent expression in their various dances and music. Dance and music have been part and parcel of tribal life. They are very simple and their way of life is gay. Theatre has been part of the Lai Haraoba festivals since time immemorial. Lai Haraoba is a Manipuri festival associated with Meiteis and it is celebrated to please traditional deities. Theatre in Manipur is divided into religious and secular based on the texts. As popular art forms, the religious plays are adaptations of Hindu epics or some episodes performed mainly in the sacred venues such as temples. Some of the religious themes are 'Gauralila' (childhood days of ChaitanyaMahaprabhu), 'Sanjenba' (Lord Krishna, cows and Gopis), and Udukhol (Lord Krishna's childhood). Secular theatre is divided into Shumang Lila (courtyard play) and Phampak Lila (stage drama). Courtyard plays are performed in an area of 13x13 feet in the centre of an open space without any prop-ups. Shumang Lila is done in a very simple style without a raised stage, set design, or heavy props such as curtains, background scenery, visual effects, etc. Its claim as the "theatre of the masses" is underlined by the way it is performed in the middle of an audience that surrounds it, leaving one passage as both entrance and exit. On the other hand, Phampak Lila (stage drama) is performed on a formal stage that is similar to the Western theatricals and Indian Natyasastra model, but the contents are indigenous. The so-called modern theatre descended on Manipuri theatre culture with the performance of Pravas Milan (1902) under the patronage of Sir Churchand Maharaj(1891-1941). Manipuri theatre is well respected because of its excellent productions which had received national and global plaudits. Both Shumang Lila and Phampak Lila have been a regular feature in the annual festival of the National School of Drama, New Delhi. Ras Lila is a classical form of Manipuri dance based and inspired by the theme of Lord Krishna and his beloved Radha's love story and the devotion of the Gopis (companions) toward the Lord. This graceful and elegant movement of the dance make it one of the most acclaimed classical dances of India. The costume is rich as there are nicely embroidered clothes that give lustre to the beauty of the art. ISKCON led by Bhaktisvarupa Damodar Swami has put Manipuri's Rasa Leela on global map with its performance in many prestigious events like World Conference on Science and Religion, United Religions Initiative conference and Kumbha Mela, among others. Khamba Thoibi dance is a duet of male and female partners that is dedicated tothe sylvan deity Thangjing of Moirang. It is the depiction of the dance performed by Khamba and Thoibi, the hero and heroine of a historical episode in Moirang. Maibi dance is performed during Lai Haraoba festival of Meiteis. The Maibis, the priestesses, trace through their dances the whole concept of cosmogony of the Meitei people and describe their way of life. Nupa Pala which is also known as Kartal Cholom (cymbal dance) is a typical Manipuri dance and music. It is a group performance of male partners using cymbals and wearing snow white ball-shaped large turbans. They sing and dance to the accompaniment of Mridanga, an ancient classical drum 'Pung' as it is called in Manipuri. Manipur has a population of 2.7 million. Of this total, 58.9% live in the valleyand the remaining 41.1% in the hilly regions. The hills are inhabited mainly by the Nagas, Zomis, Kukis and smaller tribal communities. The fertile valley is occupied by the Meiteis, Bamons (Manipuri Brahmins) and Pangals (Manipuri Muslims). Racially, Manipuri people have features that are similar to Southeast Asian countries. The Meiteis constitute nearly 47% of the state population. After the Meiteis, the Kukis have the second highest percentage of the population. The third are the Nagas who are further sub-divided into sub-tribes: Rongmei, Tangkhul, Poumai, Mao, Maram, Liangmai and Zeme. Hilly people constitute 30% of the state population. Few of the Nagas live in the plains, but for most of them hills are their permanent abode for centuries. About 41.39% of Manipuri people are Hindus. Vaishnavism became a dominant force in Manipur in the 18th century when the King Garib Niwas (1708-48) declared it as the official state religion. This was the Vaishnavism of Chaitanya Mahaprabhu, the Bhakti preacher of Bengal, which stressed Krishna Bhakti. The Hindu population is heavily concentrated in the Manipur valley among the Meitei people. The districts of Bishnupur, Thoubal, Manipur East and Manipur West are all Hindu majorities averaging 67.62%, according to the 2011 census. Christianity is followed by 41.29% of Manipuris. It was brought by missionaries to Manipur in the 19th century. Christianity brought a marked change towards the civilisation of the hill people. In the 20th century, a few Christian schools were established, which introduced Western-type education. Respected schools in Manipur are Little Flower School, Don Bosco High School, St. Joseph's Convent and Nirmalabas High School, which are all run by Catholic priests and nuns. The overwhelming majority of the population in the Hill districts are Christian Nagas and Kukis. Folk religions are practiced by about 8% of the state's people. These religions have a long history in Manipur. 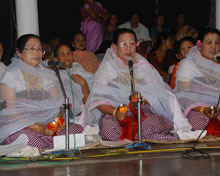 Sanamahism is the ancient indigenous religion of Manipur. Sanamahi worship is concentrated around the Sun God (Sanamahi). The official languages are Manipuri (Meeteilon) and English. Meiteis practice various faiths including Hinduism, Christianity and Sanamahism. There are also Meitei Brahmins who are called Bamons in Manipur. 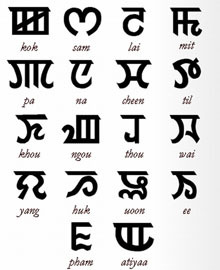 The language of Meitei is called Meithei (or Manipuri) and is the lingua franca in Manipur. Manipuri is listed in the Eighth Schedule of the Indian Constitution. Manipur has diverse ethnic groups speaking different languages and dialects. There are 29 different dialects spoken in Manipur. The six main hill dialects recognised by the state government as the medium of instruction and examination up to class XII (12th grade) are: Mizo, Zou, Poula, Thadou, Vaiphei and Tangkhul. Most of the festivals are celebrated on the basis of lunar calendar. Whatever festivals or events observed in the Indian mainland are also followed with great enthusiasm. 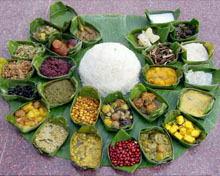 Held in November, this is a social festival of the Meiteis and many communities where the married women (Ningol) are invited (Chakouba-literally calling to a meal for dinner or lunch) to a feast at their parental house along with their children. Besides the feast, gifts are given to the women, other invitees and to their children. Held after the harvest festival in November, this festival predominantly celebrated by Kuki-Chin-Zomi tribes in Manipur. Kut is not restricted to a particular community or tribe but the whole state populace takes part in merriment. On 1 November the state declared holiday for Kut celebration. The festival is marked by various cultural events such as traditional dances, folk dances, songs, sports and the Miss Kut contest. Yaosang is a festival celebrated in spring season starting from the full moon day of Lamda (March) for six whole days by the Manipuris living in the world. Yaosang combines Hindu and indigenous traditions. It is identified with the festival of Holi and is considered the one of the mostcolourful festivals in Manipur. The Pangals (Manipuri Muslims) observe Ramzan along with the rest of the Muslim world. After the thirtieth day of the month, when the new moon is visible they break their fast at Id-Ul-Fitr. Children play with crackers, balloons, toy-guns and go from one house to another house asking for money in the name of 'Id ki Paisa' from the elders. Also known as Sajibugi Nongma Panba, the festival is usually held in March or April. Cheiraoba (literally means 'stick announce') is the new year of Manipur. It is the celebration of New Year during the spring season. People feast then climb up a hill together later in the day to signify overcoming hurdles and reaching new heights in the New Year. It is a festival observed by the Zeliangrong people. This 5-day event is usually performed on the 13th day of the Meitei month of Wakching as per their lunar calendar.